You are here :Home Articles Kinmen Island: China Without Communism? This is what China may have been like without Communism, I though to myself as I rode a public bus into Jincheng, the largest city on Taiwan’s Kinmen Island. I was only a few miles off the coast of mainland China in what was once a full-fledged part of that country a little over 60 years ago, but the differences in architecture, city planning, social organization, and some of the tangible manifestations of culture were stark and obvious. The cities and villages of Kinmen are a far cry from the ultra-planed out, community wide development strategies that are common on the mainland. The architecture of Kinmen is nothing if not a mixed bag: traditional Chinese architecture is juxtaposed next to modern and semi-modern buildings, swallowtail roof houses often have modern concrete and rebar buildings rising up right next to them, old-style brick and mortar structures are place side by side concrete ones made to somewhat resemble them. The ages of the architectural styles on Kinmen also vary greatly — from traditional to war era to modern — and they sprout out of the little island all together, as though a flea-market were blended with Wal-Mart. It is clear that neighborhood wide redevelopment and/ or renewal plans have no place here, buildings are constructed and torn down independently of each other (though the fact that this area was once bombed excessively probably had no small effect on the inconsistencies in architectural styles and time periods). The complimentary, pre-planned, faceless buildings that’s the hallmark of the communist mainland are absent here, Kinmen instead looks like an untended architectural garden. 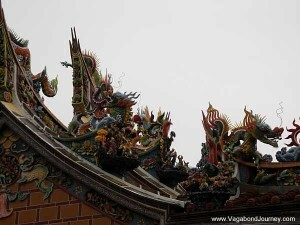 Elaborate and colorful roof of a Taoist temple. The streets of Kinmen were also like something out of nature: they seemed to have arose out of the earth of their own volition, bending and winding like the tunnels in an ant colony with no respect for right angles, pattern, or planning. I walked through the streets and found myself almost lost in the maze. One street wound into another, bending, curving, and sometimes petering out in alleyways. Intersections here were like branches on a twig, as streets ran together at very inconsistent angles. This is how many old cities and villages were once laid out all through mainland China, but over the past sixty or so years places like this have been getting bulldozed and then stamped over with nice, neat grids. In Jincheng, newer buildings were just built right up next to older ones in compliance with the city’s old-time layout, and the antique aesthetic continues into the present. As I walked through Jincheng the difference in modernization schemes between here and mainland China was clearly obvious: rather than tearing down everything that had the semblance of looking old and building virtually identical concrete buildings in their place, Kinmen went the opposite direction and revamped their traditional architecture for the modern age. Many of the buildings around Jincheng were of the old style, but they were fully equipped with the amenities of contemporary times: electricity, plumbing, etc . . . The new was built within the frame of the old, and the two blended together surprisingly flush and naturally. In this context, 7-Elevens did not look out of place next to old-style brick houses with tile roofs. Nothing more here seemed to have been upgraded than what needed to be. The streets were modern — they were either paved or had new stone tiles nicely laid upon them. Many businesses had electric signs hanging off their fronts and the interior walls were plastered and painted as nicely as if they were inside of a modern building. One thing was clear just from looking at Jincheng: the place grows and changes without an omnipotent, top-down, overbearing, all encompassing plan — very different than on the communist mainland. Kinmen built the new within the old and made it look natural. The effect was a place that gave the overwhelming impression of having soul. 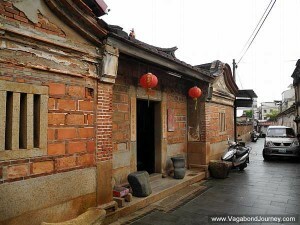 The vibe on Kinmen was also incredibly different than on mainland China. The people didn’t rush around in the streets, the pace of life seemed turned down a half dozen notches, the development seemed to run at a natural, gradual rate. Everything here seemed incredibly even-keeled. Even in many rural, backwater parts of mainland China the pace of life is revved up high: the people are rushing from their factory to their homes, perpetually working their fields, tinkering with something or other etc . . . Life in China is being changed and altered everywhere with various five-year plans, this development scheme, or that government project. 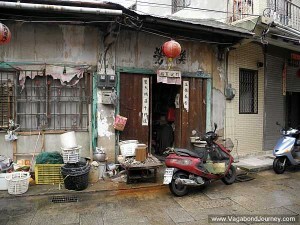 Life on Kinmen just seems to happen by itself. China is a country in rapid motion, ever racing towards the future, whereas Kinmen is a place that seems to be content strolling lazily into the future. 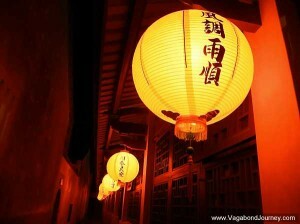 A Chinese lantern at a temple. To look at Kinmen is to see what China may have been like without the cultural and developmental upheavals of the communist PRC. Looking at Kinmen is, in a way, like looking at what may have happened if China progressed at a more even pace, did not go through a “Great Leap Forward,” or a “Cultural Revolution,” and did not micromanage their population in a fashion that’s become the hallmark of communism. Life seems very open and relaxed on Kinmen. Though there is still a heavy military presence on the island, this currently doesn’t seem to provoke a security culture of any kind. Public surveillance, regulation, and censorship do not seem to exist here in any excessive form. I walked into a hotel on Kinmen and the only thing I needed to pass across the reception desk was money. There was no registration, no paperwork, no need to show my identification, my visa, or even give my name or nationality. I was not refused service at any hotels because they did not have a permit to accommodate foreigners. There was absolutely no monitoring of where I, or anybody else I presume, took up temporary residence. The government here just doesn’t really seem to care about such things — the contrast with China’s public surveillance infrastructure is absolute. As I walked around Kinmen I saw various Taiwanese people on computers using Facebook and Twitter and other sites that are banned and censored on mainland China. The internet is as free in Taiwan as in most other countries in the world, The communist-esque censorship ethic just doesn’t exist here — and the people are not tearing down their government, creating mishap, and disrupting the fabric of the social order as, apparently, the PRC assumes their population would do if given the same liberties. Religion is also nearly ubiquitous on Kinmen Island. Taoist, Christian, and Buddhist places of worship cover the streets. Unlike on the mainland, religion was never persecuted here, and there is a direct continuation of practice that extends back into Chinese antiquity. Though religion seems to be making a tentative comeback in China, the damage that was done during the first three or four decades of the communist era is virtually irreversible. Though temples are being rebuilt and people are again allowed to worship, the passing down of belief was strangled — if not cut off — for two or three generations. When the generational chain of a cultural tradition is broken, it is very difficult to reassemble it again. The people of Taiwan are as Chinese as they are in China, but they live without the yoke of surveillance, censorship, and invasive top-down social ordering — yet it is still peaceful here, politically stable, and economically viable. “I like Taiwan, the people are free there,” a traveling salesman once told me in China’s Jiangsu province. This sentiment was echoed on Kinmen when I asked a Taiwanese man what the difference was between Kinmen and mainland China. Kinmen, and I imagine much of the rest of Taiwan, is what China may have been like without the red flag. 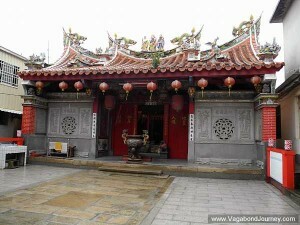 « Kinmen Island, Taiwan: What Is This Place?